Landscape design and build specializing in sustainable, drought tolerant landscapes that conserve water. 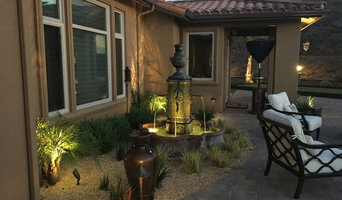 Thousand Oaks Specialty Landscape Design-Build - 4x Best of Houzz! With over 20 years of experience creating outdoor environments in southern California and the intermountain west, Aurora is ready to help you turn your outdoor landscape into an inviting extension of your indoors. Whether the desire is security, or purely aesthetics, Aurora is equipped to transform your outdoor space. We proudly service residential and commercial spaces in the greater Los Angeles area including Ventura, Orange, Los Angeles, and Santa Barbara counties. G & L DESIGN BUILDING AND LANDSCAPE, INC.
4 Seasons Remodeling & Design Inc.
Over 12 years of successful practice of designing and personalizing environments in Los Angeles, comes from dedication to building long-term relationships with our clients. Clients hire us because of our unique construction work, along with our dedicated design team that can help you create and personalize your dream space with a budget in mind. We are a full-service professional landscape construction firm and design firm practiced in facilitating every step of your outdoor project; including conceptual design, budget planning, permits and project management. We welcome your contact to discuss your project. Landscaping projects & maintenance in Los Angeles area We work closely with our clients to actualize their ideas and ensure that they have a role in the creative process every step of the way. We provide a variety of trained professionals to get to the best advice on types of vegetation and trees to plant. In order to keep our prices down, We have learned from experience that it is important to have partnerships with local providers. Thus, over the years we have developed partnerships with local businesses for most of the material we use, making our materials easy to obtain and keeping out costs low. 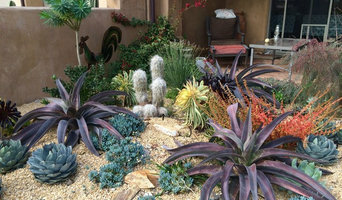 Bragar Landscaping is a local landscaping company that is committed to helping you save money and the environment through using native Californian drought-tolerant plants. We recognize that each person wants something different, and that’s why we never go with the same generic design. We create one that’s unique for you and then build it using only the finest sustainable materials and environmentally friendly plants. With over 20 years of experience, we have helped many clients throughout Southern California and know that they can help you no matter how big or small your needs are. They’ll cater to you every step of the way and will put in the hard work so your landscape always stays looking beautiful. If you’re ready to save money and time in maintenance with a drought resistant landscape, call today to learn more and schedule your appointment. We are Property Assessed Clean Energy (PACE) Approved! Black Diamond Paver Stones & Landscape, Inc.
G&L DESIGN BUILDING AND LANDSCAPE INC., is a licensed general contractor builder who specializes in the outdoors construction,hardscape , pool constriction landscape, design / build company that has been servicing residential and commercial clients in the Los Angeles and Ventura counties. Our design service includes a landscape colored concept plan, plant images and a rendering if necessary. Although unique and functional design is our passion, outstanding customer service is our number one priority. Our talented landscape designers will listen to your needs and then use their expertise to develop an architectural-quality landscape design that fits your personality and lifestyle. It is our high quality of installation, and job-site management that insures quality control and has placed us high on the ladder of success and secured our place in the landscaping industry. Our mode of operation, low overhead and aggressive pricing mindset all combine to bring you industry-leading performance at reasonable and highly competitive prices All of the principals involved with your project, from the company's president on down, are available to receive your call, e-mail or text messages. We believe that an open, on-going and unhindered communication is pivotal to a successful project and happy clients. 85 years and counting… Scarlett’s Landscape, Inc had its beginnings as a residential landscape maintenance company in Depression-Era, 1930s Los Angeles. After 4 generations, we continue to re-invent ourselves to stay relevant in this ever-changing environment of water restrictions and green building practices. We currently specialize in Outdoor Design - Build services for residential and commercial clients across Southern California. We are still family-owned and operated and have a dedicated team of architects, designers, and construction crews on our staff to provide the highest quality planning, installation, and project management. The experience and knowledge that our various team members possess is reflected not only in the quality of our projects and long lists of satisfied clients, but in our numerous certifications including: Landscape Industry Certified Technician through NALP (formerly PLANET), Allan Block Level II Experienced Certified Installers for residential and commercial retaining walls, ICPI Certified Concrete Paver Installers, and Certified Water Managers through CLCA. Please visit the following link to read reviews from over 100 of our happy clients: www.customerlobby.com/reviews/17259/scarlett-s-landscape/ The Best Choice for Outdoor Design/Build Projects by providing an amazing experience. I will make simple for you. We know what is important to you is having a beautiful home inside and out! And we deliver that on 100% of the jobs we do. We beautify any location in homes throughout Ventura and Los Angeles county with artificial grass. We haven't left anyone down in our 8 years of operating and we certainly won't let you down! Hope Gardens designs, installs, and maintains organic vegetable gardens and native, drought-tolerant landscapes...and pretty flowers too. Weeds Garden & Interior Design is a full service landscape design-build firm, licensed and insured. We specialize in sustainable, climate appropriate and waterwise plantings. We strive for sustainability in both our practices and finished projects. Our goal is to create and install your dream outdoor space, be it large or small. Instagram: @weedsgardendesign We can also provide drawings & documentation for new construction / substantial remodels for submission to city agencies, complying with all of the new MWELO landscape and irrigation regulations as required by the State of California. Mathew Gray was destined to become a landscape artisan. As a young boy, he grow up in the family landscape company in Memphis, and couldn’t imagine pursuing any other career path. Now a leading licensed contractor in California for over 22 years, Mathew Gray Landscaping specializes in making outdoor spaces feel more like home. With his stunning, refined aesthetic and knowledge of the latest design trends and innovative techniques, Mathew is passionate about helping his clients create their custom dream landscape. We look forward to working with you! Element Landscape prides itself on being a family owned and operated business. 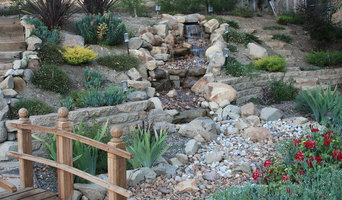 We are a premier design build general & landscape contractor serving the Ventura County area. Eric’s wife Jodi is Element Landscape’s Office Manager and Bookkeeper. Arnulfo, our Field Supervisor, has 30+ years of experience in the landscape industry working with Eric for the majority of that time. The team works closely together to ensure their customers get the best possible experience while providing affordable solutions to their home and yard needs. Since 2007 Eric has expanded on his vision by becoming a subject matter expert on water features, outdoor lighting, and agricultural infrastructure. Element Landscape has evolved from strictly a landscape and irrigation firm to a full service provider for homeowners. Whether your project is indoors or outdoors, Eric and Element Landscape can be your single point of contact to complete the job. Landscape design is the art of arranging or modifying the features of a landscape for aesthetic or practical purposes. A successful yard does not simply happen for a Landscape designer, or a Landscape architect, or a Landscape contractor. Design is the starting point, with the analysis and creative ability not only to organize the garden to accept what you want within the boundaries, but also to absorb and embrace what lies beyond. The problem so often is while we are comfortable planning rooms inside the home, more often than not we lose our way outside. The style of the garden in your home is up to you. It may be a contemporary extension of the most modern architecture or a soft, sensual and sinuous place winding between narrow boundaries. 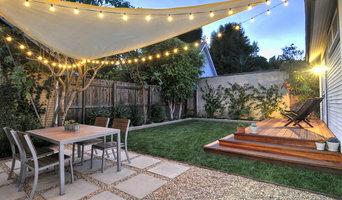 For Garden Design and Landscapes, located in Los Angeles, a yard can be so much more than grass. Well planned landscaping, created by our department Landscape design, unites indoor and outdoor spaces, resolves yard and garden problems, and provides creative opportunities to relax and have fun. What does a Westlake Village landscape contractor do? Landscaping contractors execute lawn, garden and hardscaping plans that have been drawn up by an architect or designer. They may also provide design services on their own. After the everything has been installed, landscape companies can make adjustments, maintain plantings, take care of weeds and pests, and perform other tasks to keep the scheme looking its best. A licensed California landscaper should have detailed knowledge of Westlake Village, CA weather and climate trends and conditions, and can choose plants and materials that are well suited to the area. Residential landscape companies in Westlake Village, CA also handle many of the same general duties as builders, including arranging for construction permits, hiring subcontractors and making sure that designs comply with California building codes. Here are some related professionals and vendors to complement the work of landscape contractors: Landscape Architects & Landscape Designers, Garden & Landscape Supplies, Stone, Pavers & Concrete, Tree Services. How long have you been in the landscaping contractor business? Can you provide me a written estimate? Find Westlake Village landscaping services on Houzz. 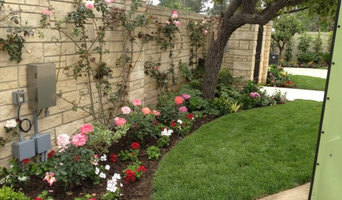 Narrow your search in the Professionals section of the website to Westlake Village, CA landscape contractors. You may also look through photos of California landscapes to find one you like, then contact the landscaping company in Westlake Village, CA who worked on it.